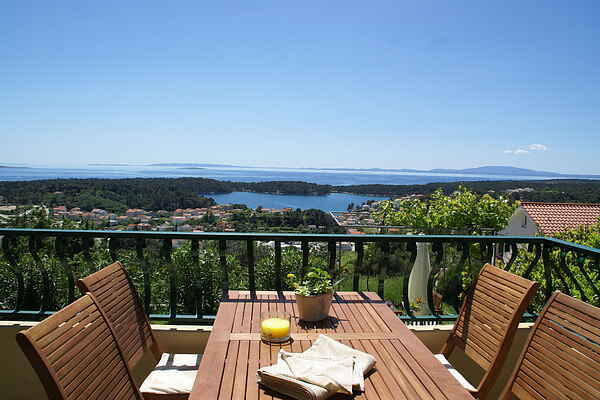 In your apartment you are treated to a breath taking view; the historical city of Rab, the wonderful coast line, the clear blue sea and the islands of Cres, Losinj, Krk and Pag afar. You cannot get bored. In the shared garden of the apartment you can find a cozy seating area. The furniture is nice and clean and well taken care off. Internet connection. Your holiday starts on the ferry that leaves from the mainland. After a beautiful boat ride you will arrive on the island of Rab, a famous holiday destination with sandy beaches, bays and a nice and mild climate. You can make wonderful walks through the little streets and enjoy the many monuments. When the night falls, the center really comes alive; the market opens, people enjoy a wonderful meal in one of the many restaurants and stroll around the port. You are lucky, because your apartment is only at 1,5 km distance from this center. The closest beach is a 15 minute walk away (800 m). Do notice that on your way back, the walk will be a bit longer since you're going up the hill. The beautiful beaches of the popular tourist resort Lopar are at a distance of 12 km. Restaurant at 50 m. Groceries at 600 m.